LET SAMY TELL YOU ABOUT OUR JOURNEY ! The train that started it all! I was only 5 ½ years old when I was at my grandfather’s house. I went in to a big walk-in closet that was almost empty and thought it was a good idea to make a secret clubhouse. I called my grandpa to come in and look and he thought it was a good idea too. When I think about it I probably knew he would. We found only one box in the corner that looked very old so we decided to open it. Inside the box we found a Lionel train set that my grandfather was given in 1950! We decided to name the engine “Old Bob”. This engine inspired us to make our own train layout. 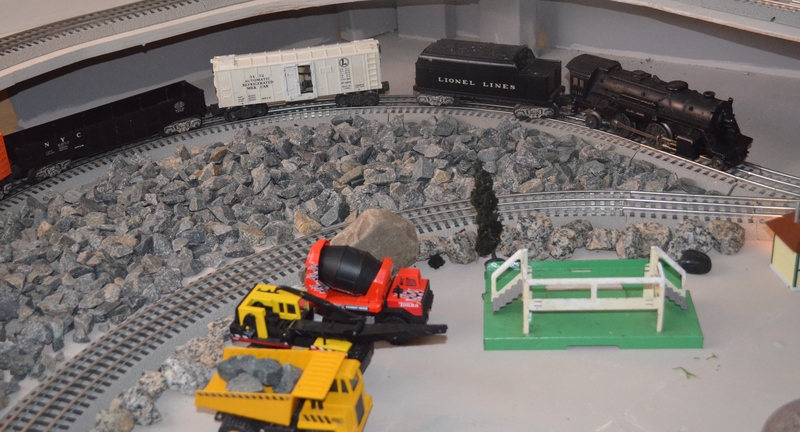 It sounded like fun to make all the stuff for the layout and get more trains. We would have a cool layout to play with. One of the coolest things was making the mountain and making the tunnels through it. We added a bottom part to the mountain with a log cabin on one side and a stream and waterfalls on the other. I loved going on “expeditions” with my grandpa. One of my favorite expeditions was the first one we ever took. We went to a wooded area that had a really large rock wall and getting ideas for our layout and even collecting rocks was fun. It was the most fun because everything was new and I saw stuff that I never saw before. It was very adventurous. I loved when Grandpa told old stories about his father and how he worked for General Motors making roller bearings that were used in tanks and how he almost fought in the war. A very difficult part was figuring out the track plan, changing it around, screwing it in, and building the different levels. The first day of building the table was fun. When we put the train on we were making the track go so high. At the end of the day, it was really “Old Bob” who was the founder of the whole layout and started Grandpa and me on our journey through time. The whole thing was so much fun and I learned a lot but I know nothing would have happened without Grandpa!